The Detective Store brand has been on the market since the year 2007. It specialises in selling detective equipment for surveillance and counter-surveillance, but also in gathering and protection of information and property safety. The offered assortment is always of high quality and at optimal price. That is why it is used by both professionals and amateurs. We cooperate with government institutions, law enforcement services, law offices, detective agencies and property protection agencies. Our equipment allows the companies to control the efficiency and honesty of employees, protects against industrial espionage and leak of confidential data. We support parents by controlling a rebellious teenager and dishonest babysitters. You can also check partner's honesty and protect your family. All this results in increasing safety and peace of mind. We are part of a field of industry which develops quickly, so our reactions to the clients' needs are fast. We also implement novelties. Before including the product into our offer, we conduct our own independent practical tests. We discard products which do not meet our own expectations. Presently, we have 7 brick-and-mortar shops in Europe. We are also present in the German, Polish and the Czech Republic markets. Because of the fact that the company is developing and the detective equipment is increasingly more popular, we plan to open some new shops. 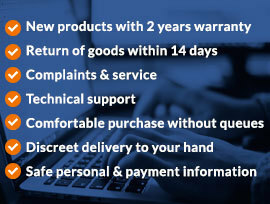 We offer attractive conditions of shipment and the possibility of returning products. We are active in the environment of modern technologies. We cooperate with trade media, organizing promotion campaigns and contests in which you can win some of our products. We created a detective blog which deals with topics such as espionage, criminology and legal matters. It also presents interesting aspects of how our professional equipment may be used in everyday life. You'll get news about sales, great discounts, fresh offers and software updates in Detective Store.